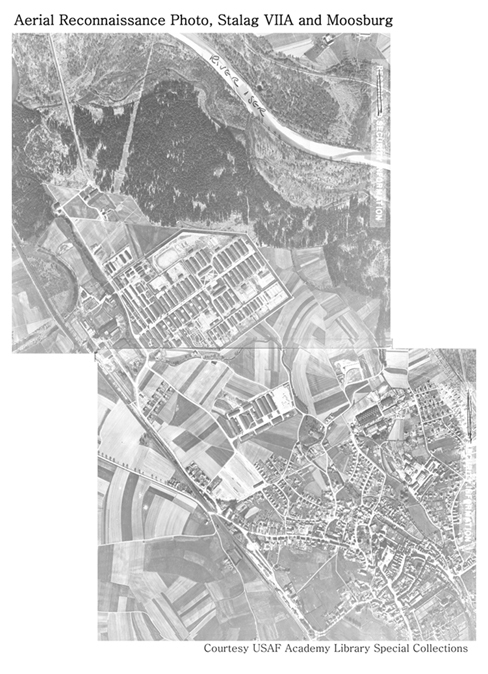 On 30 April, 1945 the New York Times reported; "Huge Prison Camp Liberated...27,000 American and British prisoners of war at a large camp at Moosburg." The report was correct, the camp was huge, but it was also wrong. 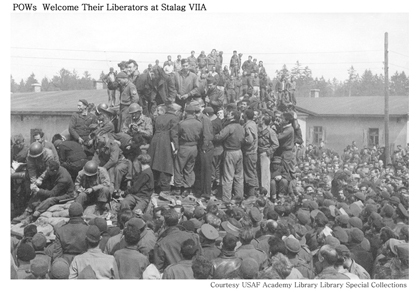 The following day, the Times printed a correction; "The Fourteenth Armored Division liberated 110,000 Allied prisoners of war at Stalag 7A at Moosburg, instead of the 27,000 prisoners previously reported. This was Germany's largest prisoner of war camp." On 28 April the 14th Armored Division crossed the Danube River at Ingolstadt, and passed through the 86th Infantry Division, which had established the bridgehead on the previous day, with the mission of securing crossings of the Isar River at Moosburg and Landshut. Combat Command A (CCA) was on the right of the division's line of advance, Combat Command R (CCR) was on the left, and Combat Command B (CCB) was in reserve. The combat command advanced nearly 50 miles on the 28th, against sporadic resistance. CCA Headquarters settled in for the night at Puttenhausen at 2300 hours. The main force, including the 47th Tank Bn. and the infantry of B-68, was eight miles to the southeast at Mauern. They were only four miles from Moosburg. The entry into Mauren had not been an easy one. Not long before midnight, the infantry went in ahead of the tanks to clear the town, and were ambushed by SS soldiers using machineguns and automatic antiaircraft guns. The enemy resistance was eliminated in a short, but intense fire fight. B-68 lost several men before the town was finally secured. The party included a representative of the Swiss Red Cross, a major in the SS, Col. Paul S. Goode (U.S. Army), and Group Captain Willets (RAF). The latter two were the senior American and British officers from Stalag VIIA, a prisoner of war camp near Moosburg. The SS major carried a written proposal from the area commander, which he was to present to the commanding officer of the American force. After a brief discussion, Lt. Col. Lann escorted the group to Puttenhausen to meet with Gen. Karlstad. The combat command's intelligence officer (S-2), Major Daniel Gentry, was on duty in CCA headquarters when Lt. Col. Lann arrived. Lt. Col. Lann went in, leaving the delegates to wait outside. He told Major Gentry about the delegation, and asked if Gen. Karlstad was available. Major Gentry told him that the general had just awakened, and would be in the command post shortly. Gen. Karlstad walked in a few minutes later, and heard Lt. Col. Lann's report before the delegation was brought in. On learning the details of the German proposal, Gen. Karlstad sent a radio message to division headquarters at Manching, asking the division commander, Maj. Gen. Albert C. Smith for instructions. It was clear that if accepted, the proposal would prevent CCA from capturing the bridge across the Isar River, as it was located within the proposed "neutral zone." It would also give the retreating Germans more time to withdraw across the river, and provided them with the opportunity to move at least some of the Allied prisoners with them. Gen. Smith rejected the proposal, and added a demand for the unconditional surrender of all German troops at Moosburg. Gen. Karlstad relayed Gen. Smith's response to the SS major. He did not issue a deadline by which the German commander must respond or make any allowances that might further delay the combat command in the fulfillment of its mission. After the delegation left the command post to return to Moosburg, Gen. Karlstad issued orders for the attack on Moosburg to proceed. In his message, Gen. Smith had ordered Gen. Karlstad to: "Lead your troops into Moosburg." The order was unusual, and not in keeping with the way Gen. Smith typically worded orders to his officers. As a result, there was some discussion in the command post regarding Gen. Smith's meaning. Gen. Karlstad decided that it was his superior's intention that he was to actually lead the attack. He subsequently climbed into his peep (jeep), along with his aide, 2nd Lt. William J. Hodges, and accompanied by Lt. John Sawyer of D Troop, drove to the 47th Tank Bn. headquarters at Mauren. There he joined Lt. Col. Lann, and with him, moved with the tank battalion in its attack on Moosburg. There was no further discussion regarding the prison camp or its capture. The combat command was to continue with its primary mission of seizing a useable bridge across the Isar River. Regardless, the liberation and security of the Allied prisoners of war was clearly of great importance, and the combat command would take the necessary steps to ensure this was accomplished. The men of the division had done this sort of thing before. Three weeks earlier, they had fought their way into Hammelburg to liberate Stalag XIIIC and Oflag XIIIB. 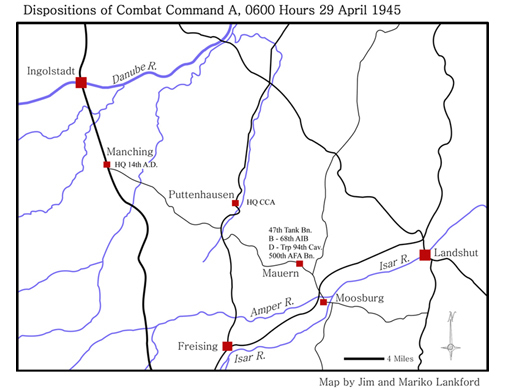 As soon as its units were in position, CCA attacked down the main road between Mauern and Moosburg. The infantry platoons of B-68 were attached to the tank companies. The tanks of C-47, along with the 2nd platoon of B-68, were in the lead. They were followed by the tanks of B-47, with A-47 in support. Simultaneously, a platoon of tanks from C-47, and a platoon of infantry executed a flanking maneuver on the right of the main line of attack. Lt. Col. Lann took command of the main force, and Major Alton S. Kircher, the 47th's Operations Officer (S-3), led the flanking force. Since there were so many Allied prisoners of war in the area, the risk of casualties due to "friendly fire" was high. As a result, the attack was made without the powerful guns of the 500th Armored Field Artillery Bn. The main force advanced without meeting any resistance to a point about 1 mile west of Moosburg, where the road crossed the Amper River. It was there, on the east bank of the stream, that the SS decided to make their stand. The first tank to move across the bridge came under intense small arms fire from SS troops located on the far side of the stream. The infantry quickly took cover behind the tank, while the rest of the tanks and infantry took up positions along the bank of the river, and opened fire on the enemy positions. Several infantrymen on the bridge were wounded by the first bursts of enemy fire. After they were evacuated from the bridge, the American tanks and infantry moved forward into the fight. The SS fought from dug-in positions in the fields leading to the town, and from positions behind a railroad embankment on the American's left flank. The embankment was about 500 yards from the bridge, and lay on a direct line between it and the prison camp. Resistance was stiff, even fanatic, but short lived. The SS had no tanks or antitank guns, and were armed only with small arms, machineguns, mortars, and panzerfausts. The battle-hardened Americans fought their way through the SS positions in the fields with relative ease, while returning the fire coming from the railroad embankment. The Germans surrendered when the Americans reached the edge of Moosburg, and by 1030, "... the SS were lying dead in their foxholes or going to the rear a prisoner...."
The tanks of C-47, and their supporting infantry, moved out at once to seize the bridge across the Isar. They raced through the streets at 20 miles an hour without meeting any resistance. On arriving at the bridge, the force came under small arms and machinegun fire from the far side of the river. The infantry dismounted from the tanks, and returned fire while the lead tank rolled out onto the bridge. Just as the tank got fully onto the bridge, the Germans set off the demolition charge, and the center of the bridge disappeared in a massive explosion. The section of the span under the tank began tilting precariously down, towards the water. The driver brought his 32 ton vehicle to a halt, and slammed its transmission into reverse. With the tank's treads spinning, he skillfully backed the tank off the tilting portion of the bridge, and onto firm ground, before it slid into the river. Col. Goode and Group Captain Willets had arrived back at the camp shortly before the engagement at the Amper River bridge. They told their fellow prisoners that an armored unit was coming to free them, and while the German resistance was expected to be light, they should keep their heads down. The prisoners and guards watched as the SS took up defensive positions in the area. It was not long before the sounds of battle came from the distance. The fight for Moosburg was underway. Fire from the American tanks and infantry, aimed at the SS who were firing from behind the railroad embankment, came into the camp. Prisoners and guards alike hurriedly sought cover in ditches, under buildings, and behind brick walls. Adding to the commotion was the sound of the demolition charges exploding as the Germans destroyed the bridge across the Isar. As soon as it had started, it was over. The firing ceased except for the occasional sounds of small arms and machinegun fire from the direction of the bridge. Gen. Karlstad called for the German Camp commander [Col. Otto Burger] and received an unconditional surrender of the German garrison and the camp. The first allied prisoners to present themselves were Group Captain Willets and Colonel Goode, .... 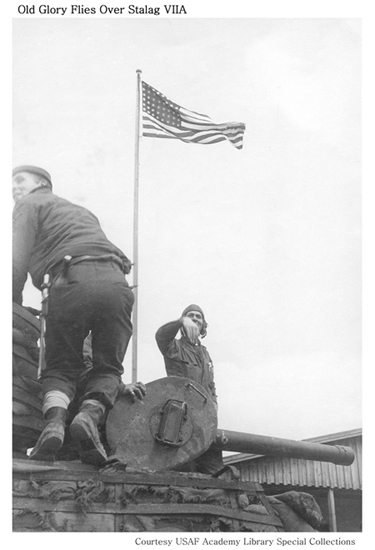 In a few moments an enterprising American produced a United States Flag – from where, perhaps only he knew – and amid thunderous cheers from the prisoners, ran it to the top of the camp flag pole. It was a dramatic moment."